Young members of the CPGB-ML organised an impressive and colourful contingent at this year’s May Day march and rally in central London, once again demonstrating the continued growth and development of our party. Ours was by far the largest and most impressive contingent of any British organisation. By contrast, a mere handful marched behind the banner of the revisionist Communist Party of Britain (CPB), who have predictably lost a number of members to the Labour party since Jeremy Corbyn’s election as leader. Meanwhile, a militant contingent of party youth led the way for the CPGB-ML, demonstrating the true fighting spirit of May Day as the common festival of the working class throughout the world. Our party was especially happy to be joined on the march by a substantial contingent of members from the Indian Workers Association (IWA(GB)). Many of us have a very long association with comrades from the IWA, and we believe that our party is the natural home for those of its many sincere and dedicated activists who have spent a lifetime struggling in the British working-class movement. Our contingent really was a great sea of red, and drew plenty of attention, both from those on the march and those who we passed by. Both our presentation and the content of the slogans and speeches that were addressed to the passers-by set us apart from every other British section of the demonstration. It has never been clearer that there is only one party that takes seriously the aim of building for a revolution in Britain. Many people over the years have suggested that we would attract more members if only we would ‘stop talking about Stalin’ and take his image down from our banner, but it can be seen that the reverse has proved true: our consistent approach towards our politics and the movement has been both honest and successful. Rather than forming yet another dreary, ever-shrinking trail of disgruntled and shame-faced social democrats following worn banners and clinging to revisionist politics, our contingent was clearly the most youthful, organised, militant and optimistic. Rather than hide our communist politics and apologise for the immortal feats performed by the Soviet people under the leadership of the CPSU(B) and Joseph Stalin, we choose to celebrate them and to spread knowledge amongst working people about the heroic acts carried out by Soviet workers, during both the construction of socialism and the war against fascism. We do so in order to inspire the British people and give them confidence that the working class can take power and can, having done so, perform veritable miracles – the very same reason why those who defend the rotten capitalist system give such high priority to outrageously slandering the Soviet Union and its communist leadership. The socialist system is the most advanced society yet achieved by humankind. In a few short decades, under the scientific leadership of the Bolsheviks, the Soviet people achieved more groundbreaking accomplishments more quickly and in more spheres of life than have ever been seen before or since. Whatever the temporary reverses our movement has suffered, it remains the case that socialism alone offers us a bright future. Our party is not ashamed to say so, or to do everything in its power openly to mobilise our class to fight for that future. Reinforcing the spirit of internationalism, our contingent marched between those of our comrades from the Marxist Leninist Communist Party of Turkey (MLKP) and from the Frontline Socialist Party of Sri Lanka, both of which also were marked out by large mobilisations, a sea of red flags and large portraits of Marx, Engels, Lenin and Stalin – the great founders and leaders of scientific socialism and the international communist movement. When the march reached Trafalgar Square, our party held its own rally – an alternative to the uninspiring establishment-friendly line-up droning from the main platform. Several of our party comrades addressed the crowd of people that had gathered around our stall, delivering messages that related to the real meaning of International Workers’ Day. In his speech, our chairman Comrade Harpal Brar talked about the wholly specious ‘antisemitism’ row that has been whipped up by zionists to batter Jeremy Corbyn’s leadership of the Labour party and about the true meaning of international solidarity. Other speakers talked about the need to build our party and fight for socialism, the centenary of the Easter Rising in Ireland and the struggle to defend the NHS. Footage of the demonstration and speeches can be seen on the party’s YouTube channel, Proletarian TV. 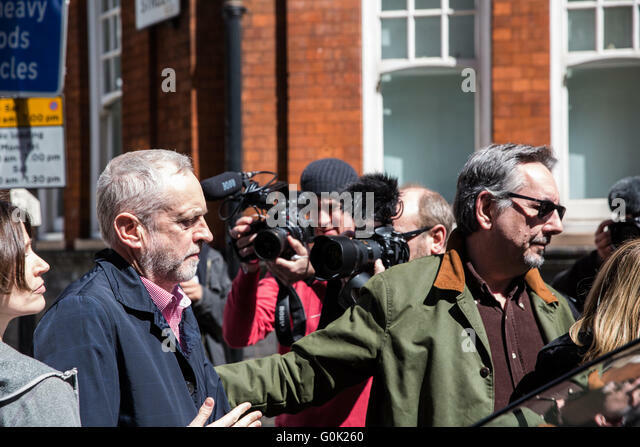 Meanwhile (and no doubt much to the annoyance of the man himself and all his friends and hangers-on), our presence got an unexpected media boost when Jeremy Corbyn was parachuted in to speak to the marchers as they gathered in Clerkenwell Green. Much was made of the fact that he was the first Labour leader in half a century to address a May Day demonstration, and our party’s very strong presence at the march was used to accuse poor old Jez of ‘keeping controversial company’ (somewhat ironic considering the real antipathy he and his close acolytes have for our party and our anti-imperialist politics). Most of the coverage in the corporate media (both TV and newspapers) the next day featured full-colour photos of our flags in the forefront of pictures of Corbyn speaking. Usually, we are ignored, but this time we were highlighted as another bogeyman to further the smear campaign against Corbyn, who was, that very weekend, facing down the ‘antisemitism’ storm. On the subject of the company Mr Corbyn actually keeps, it was noticeable (and entirely unreported) that when he appeared by the rally bus in Clerkenwell, he was surrounded by a veritable phalanx of Counterfire ‘luminaries’ in plain clothes (see the Sky News footage incorporated into our video of Comrade Harpal’s speech). Clearly, these hangers-on are hoping that JC’s star will keep rising – and will take them with it. The fact that had it not been for Joseph Stalin and the Red Army, jews would have all but disappeared from continental Europe seems to have escaped the Daily Mail editor, as has the disgraceful history of his own newspaper, which had a very close relationship to various antisemites and Nazis. So close, in fact, that in 1934, it came out openly in support of the fascists in Britain, leading with the notorious headline, ‘Hurrah for the Blackshirts’. The whole tenor of the media’s coverage this year, meanwhile, was to ram home the idea to all ‘respectable’ workers that May Day (along with other displays or celebrations of working-class strength and power) is a day held dear only by ‘extremists’ of the type who revere the evil Stalin (who we all know ate babies and shot ten workers before breakfast every day), and that Mr Corbyn, in being associated with such extremism, is proving himself to be both unrepresentative and unelectable in a peaceful, moderate (they hope) democracy like Britain. Whatever their motivations, however, as capitalist crisis deepens and imperialist wars escalate, the media barons may yet come to regret having alerted their readers and viewers to the existence of a serious communist organisation in Britain.